Get your copy of the book which went straight to No.1 on the best-seller chart on the first day of publication! 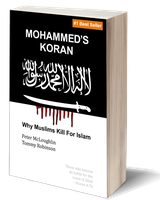 The book which shows why the connection between Islam and Islamic terrorism is unbreakable. Read the book which proves that throughout the 20th century your rulers knew all about Islam being an ideology glorifying terrorism and hatred of the other. Yet in full knowledge of this fact, the ruling class invited millions of followers of Islam into the West. All indicators are that the problems caused by Islam are only going to multiply and your children will live out their old age in their own country under the rules of Islam. We've selected 100s of the best five-star reviews from around the world. This book will transform your understanding of the current political situation, and will prove that Islamisation is a very bad prospect for your children and grandchildren. Buy the 2017 No.1 Best Seller, decode the Koran and Islam in minutes. Beams a light into the dark world of deception. A must read!